The emerging industries of wellness and direct selling are combining to create the next generation of weatlh. Since 1991, U.S. household wealth quadrupled from $13 trillion to about $52 trillion in 2005. Reading such figures, you might say, “That’s interesting… that sounds like good news.” But it becomes very personal when we look at what this actually means to individual entrepreneurs who are involved in the most economically vibrant emerging new industries. Let’s take a quick look at how this works, and then see some of the most powerful ways to ensure that you can be part of this exciting trend. In 1991, there were 3.6 million American families with a net worth of $1 million or more. Today, there are more than 10 million such families and we are adding new millionaire families at the rate of one million per year. While we’ve always had periods where the rich get richer, we’ve never had so many ordinary, working-class people become rich. You can see dramatic evidence of this at the very top echelon of U.S. wealth, the billionaires on the Forbes Over the next 10 years, as U.S. household wealth doubles to $100 trillion, at least $10 trillion of that new wealth will represent new entrepreneurs coming to the table. That $10 trillion represents another 10 million new millionaires. A great opportunity lies ahead, not for just a chosen few, but for literally millions of “ordinary people,” individual entrepreneurs who were not born into wealthy families, but who choose to apply themselves in the new and emerging industries where this new wealth is being created. Two of the strongest emerging industries where this growth will occur are wellness andnetwork marketing. Ironically, of the $2 trillion we spend on health care in this country, which represents one-sixth of the U.S. economy, most has very little to do with health. “Health” is defined in the dictionary as “being sound in body, mind or spirit,” but what we call “health care” has a very different focus, and would more appropriately be called the sickness industry. Sickness industry: Products and services provided reactively to people after they contract an illness, ranging from a common cold to cancerous tumors. These products and services seek to either treat the symptoms of a disease or eliminate the disease. Wellness industry: Products and services provided proactively to healthy people—that is, those without an existing disease—to make them feel even healthier and look better, to slow the effects of aging, or to prevent diseases from developing in the first place. I stumbled upon the wellness industry in the 1990s, as so many do, through an experience with my own health. For 10 years (against medical advice), I had put off getting expensive knee surgery. Finally, I started taking a dietary supplement called glucosamine—and within a year, the cartilage was repaired. The surgeon was positively amazed when he examined my X-rays. I no longer needed the operation. This experience piqued my interest. I wanted to find out what else my surgeon and my other medical providers didn’t know. I also noticed that people were spending more on new things such as exercise programs and fitness coaches, supplements and organic foods, alternative medicine and anti-aging therapies. I began to research this field and soon arrived at an amazing conclusion: This new and emerging industry, which only a decade earlier had hardly existed, was already a $200 billionbusiness. This represents an extraordinary economic opportunity. The millions of people spending billions of dollars to further their wellness represent a new and growing economic sector who are eating and living healthier than anyone ever before in history. They are primarily wealthy people who, as they start to have money, start looking for ways they can be healthier outside the medical establishment. Today, for example, this sector spends more than $70 billion annually on vitamins and food supplements. Who are these people? Mostly baby boomers: prosperous people from the ages of 40 to 60. Baby boomers are the first generation in history who refuse to blindly accept the aging process. They are also a powerful economic force; they represent only 28 percent of our population—yet this group and their spending represent 50 percent of our economy. Until recently, marketing to baby boomers had been all about how to help them remember what it was like to be young—oldies music, retro clothes and ’50s-styled automobiles. Now, it has gone a step further. Today, boomers are starting to buy things that actually make them younger in terms of having a healthier body, more acute senses and a sharper mind. Today, numerous scientific studies have validated what a few million Americans seem to have known all along: There are hundreds or thousands of efficacious treatments to make people feel healthier, to slow the effects of aging, or to prevent diseases from developing in the first place. But until you first experience one of these treatments working for you or a member of your family, you are probably going to remain a skeptic and miss out on improving the quality of your life, and reducing your long-term health care costs. The best way to learn about wellness is through someone close to you who has had a wellness experience. You see your college roommate and go, “My God, John, you look great. You look so healthy—what did you do?” You bump into a wellness experience and start to find out that there is a whole wellness industry out there, with all sorts of new products and services. In my 1990 book Unlimited Wealth, I wrote that the new wealth in that decade would be created mainly by people who distributed things, rather than by people who made things. The great fortunes of the 1990s would be made in distribution. But that opportunity has come and gone. The fortunes to be made today and in the years ahead will be made by those who are involved in teaching people about new products and services that they either didn’t know existed or didn’t know were now affordable. Intellectual distribution, as opposed to physical distribution, is where the greatest fortunes are being made today and will continue to be made for at least the next decade. Manufacturers today report that the greatest bottleneck they have is not in creating the next great new product; it’s how to reach people and teach them that these new products exist. People like to do things the old way. They fight change. In everything we do, from shopping and cooking to taking care of our health, we often have the nostalgic view that the good old days were better, that the good old ways are the best ways. But the “good old days” were times of manure in the streets and rampant diphtheria, of abject poverty and wretched living conditions. The truth is that the “good old days” were not so good. Nevertheless, people tend to cling to the known and resist the unknown. Consequently, when they watch television, read magazines or surf the Internet, they tend to look for things that reinforce what they already know. So where will they learn? There is really only one place: from other people. The most effective way we have to teach people the new method is one-on-one, word-of-mouth communication. This is why, even though we have sophisticated video-conferencing tools available, businesspeople will still fl y clear across the country to meet face-to-face when they have important issues to decide. I have always been keenly interested in education; I taught college students for 20 years at New York University, and in the 1990s, I developed an educational software product line. One of the most exciting things I’m seeing about this new crop of 10 million millionaires is that they are more often teachers at heart, rather than conventional businesspeople. They are people who learn about a new product or new service and adopt it for themselves and their families—but they don’t stop there. They then go out and teach new people what they just learned. Network marketing is both the oldest method of sales communication and also the newest. And it’s the best method we have today to change someone’s paradigm and teach them about a new product or service—a new way of doing something that they wouldn’t have gotten by reading a magazine, surfing the Internet or watching television. Person-to-person, word-of-mouth communication represents the cutting edge of intellectual distribution. This is why we are seeing so many Fortune500 companies jumping into the direct selling arena, and Wall Street investors such as Warren Buffet entering the business. Network marketing has grown steadily over the last 20 years, increasing 91 percent in just the last decade. With more than 13 million Americans and 53 million people worldwide involved, it is now a $100 billion global industry. Yet as impressive as this is, it’s not hard to see that the real growth in this business model has only just begun. For one thing, demand is increasing exponentially. Because of the ever-accelerating pace of technological advancement, there is a growing flood of new products and services that desperately need their story told in the marketplace—stories which no amount of screaming TV ads or sprawling Internet pop-ups and banner ads can effectively tell. Neil Offen, president of the Direct Selling Association, predicts that, at the current rate of increase, worldwide some 200 million people will enter this industry over the next 10 years, effectively quadrupling its current percentage of the population. Network marketing is already a force to be reckoned with—but its growth will explode in the coming decade. The advent of intellectual distribution is one reason that network marketing offers such a favorable opportunity, but it is not the only reason. Another powerful factor is the current boom in home-based businesses. Only 20 years ago, people who worked from home were immediately suspect, as if that implied there was something wrong with them, that they couldn’t get a “real job.” Today, the sharpest and richest people we know are the people who work at home. One factor in this change is a massive shift in the dominant unit of technology, the building block of our total economy. When I graduated from Wharton 30 years ago, I went to work at Citibank, not because I was interested in banking, but because I wanted access to the best technology, and Citibank had the biggest, best computers available. Back then, that was the only way to have access to the best technology. Computers were expensive mainframes owned and managed exclusively by large businesses, which gave them an enormous competitive advantage. Today, the opposite is the case. You are more likely to find the hottest and best new technology on the desk of an entrepreneur sitting in his home office. The unit of technology has changed from a $2 million mainframe that served huge corporations, to a home computer you can put on your desktop for well under $1,000—and which is far more powerful than the mainframe. As a home-based entrepreneur, you can now do business far better than someone who’s working in a large company and has to deal with the overhead. The big companies just can’t innovate fast enough. In the ’80s, the rule was the bigger the company, the newer and better the technology. Today, the rule often is the bigger the company, the older and more out-of-date the technology. Where are the greatest opportunities today? Even for people starting right out of school, the best opportunities are not to go work for some big company (unless it’s a company that makes tools for individuals), but to go into business for yourself as an entrepreneur. The change in technology is one reason we are experiencing such a boom in home-based businesses. Another reason is that working from home is a more personally satisfying way to live. In the new economy, the sheer quantity of compensation is no longer enough. More and more, we have come to realize we also want a certain quality of compensation, too. We don’t simply want money; we want lifestyle. It doesn’t matter how much money you earn if you never get to see your family. It doesn’t matter how many possessions you have if you never get to use or play with them. And it doesn’t matter how great of a personal economy you create if you don’t have the health to enjoy it. Te concept of “quality of life,” which we take for granted today, is actually a fairly recent invention. Our economy and living standards have grown to the point where we not only expect to make a living, but we also expect to have the best possible experience doing it. Twenty percent of the average corporate workday is spent just commuting to and from work—and up to 50 percent of the time spent actually inside the workplace is wasted around the water cooler, gossiping and talking to other people. Today, more and more people don’t want to spend their time chatting with other workers in the office—they’d rather spend that time with their spouse or their children. They’d rather get their work done in a few hours, and then get back to the business of being with their families. For these people, a home-based business today is both a more efficient way to work and a lifestyle choice. We often talk about the challenge of keeping a balance between our work and our families. Picture it like a seesaw, with work on one end and family on the other. When you’re constantly playing these priorities against each other, your life swings and swings, until eventually the whole thing breaks, whether that means losing your job, your family or your health. But if we are fortunate enough to find a way to integrate work into your home, then we don’t have to think about balance between work and family so much as how we can weave the two together. There is actually something ironic about this. The United States started out as an agrarian society of entrepreneurs, where everyone was a small-business person. The rise of the giant corporations, which my generation took for granted as the “normal” employment path, is really a historical anomaly. And it’s rapidly slipping into the history books as we return to our entrepreneurial roots. In many ways, wellness and network marketing are natural sister industries. For one thing, wellness is rich in the kinds of new technologies that are best learned person-to-person. And for another, it is often the same quest for a better quality of life that finds expression both in exploring wellness and in pursuing an entrepreneurial, home-based business. Wellness and network marketing also both represent enormous financial opportunities; either opportunity alone has tremendous potential to create new wealth. Some companies have combined the best of both worlds, creating a “perfect storm” of unprecedented economic opportunity: A convergence of forces enabling entrepreneurs to create a satisfying lifestyle, and—at the same time—tremendous new wealth. 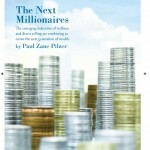 Over the next 10 years, the U.S. economy will create 10 million new millionaires. You have the opportunity to start now and become one of them. You should do so not only for the benefits in health and happiness to yourself and your family, but also because you will be adding to our economy while you also add to the wellness and personal fulfillment of many others. In so doing, you will be contributing immeasurably to your community, your nation and the world.